Having travelled around the region where Pu Er is grown, I moved further south, to Laos. There, I discovered, halfway between Paksé and Paksong, on the Boloven plateau, a small-scale factory making a very good black tea with aromas of cooked fruits, leather and spices, which will delight fans of Grand Yunnan Imperial. Curiously, the tea plants here grow in the middle of coffee plantations. 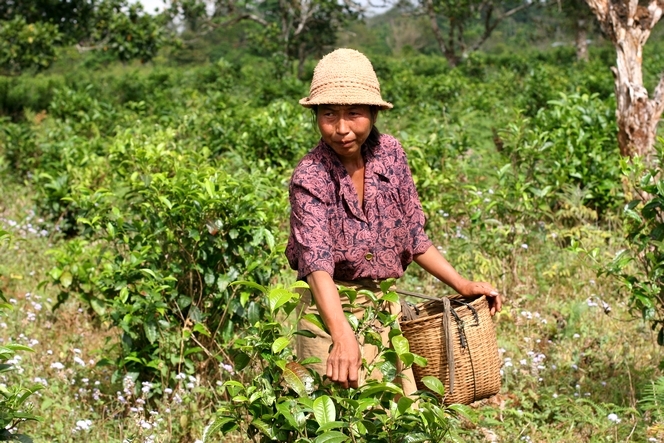 In fact, to enable the local rural population, who earn very little, to generate some extra income, the Lao Farmers Association has taught them how to grow tea, and has opened a cooperative whose purpose is to support the community rather than to make a profit. As I walked for a few hours among the tea plants and luxuriant vegetation, I noticed two things in particular: the bomb craters left by the Vietnam war, and also the incredible number of leeches you must pull off as you walk. Not only do they climb up your shoes and trousers, but the creatures even manage to drop out of the sky, or rather, the trees, and land all over you, even in the palm of your hand.